I'll admit it. Sometimes my bird bath gets dirty but when I saw a BIG MUD clump in the bath yesterday it took me a couple seconds to put the pieces together. 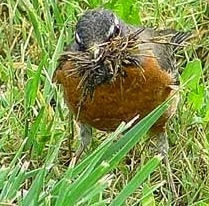 American Robin nesting season has begun! The American Robins choose their Michigan nesting territories in March and they are excited to start nesting. That means they need a lot of grasses and mud to build the perfect nest. Unfortunately my excited female couldn't find any unfrozen mud to begin construction. She brought a bunch of frozen grasses and dirt to the bath in hopes of getting a jump-start in creating nest building materials. I'm not sure how much mud she took away but she left a lot behind. Females build the nest from the inside out, pressing dead grass and twigs into a cup shape using the wrist of one wing. Other materials include paper, feathers, rootlets, or moss in addition to grass and twigs. Once the cup is formed, she reinforces the nest using soft mud gathered from worm castings to make a heavy, sturdy nest. She then lines the nest with fine dry grass. The finished nest is 6-8 inches across and 3-6 inches high.